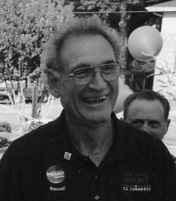 Russell Gary was born in Erath, Louisiana. During WWII, his family moved to New Orleans where his father helped to build ships, but after the war they returned to Vermilion Parish. Although Gary dearly loved athletics, he was required to work to help the family rather than participate in sports. He attended school in Erath, but Gary graduated from Abbeville High School and, thereafter, was in the National Guard for nine years. In March, 1953, Gary married Raccy Anne Breaux, now deceased, and they had two children, Cheryl and Chris, six grandchildren and nine great grandchildren. On October 22, 1957, Gary opened Gary’s Men Store in Abbeville, a popular business that operated for many years, across from St. Mary Magdalen Church. Later, he relocated the store across the street and just north of the Vermilion Parish Court House. Gary is a member of the Knights of Columbus, CODOFIL and the Acadian Heritage and Cultural Fondation, Inc.
For many years, Gary was the public address announcer for the Abbeville Highschool football games. Gary was also the color man for many radio broadcasts covering Vermilion Parish sporting events. He has an uncanny ability to remember the names of many of the Vermilion Parish student athletes that he covered during his long career supporting many educational and sporting events. In January, 1982, Gary started playing music with the “Fa Tras Cajun Band.” The band played all over the country including St. Jude’s Children’s Hospital in Memphis, Tennessee, and the 1984 World’s Fair in New Orleans. The group was also on many television programs, including CBS, which filmed the band performing at Clement’s Dance Hall north of Abbeville. As part of Governor Foster’s office, Gary worked for the State of Louisiana doing promotion for many cultural activities. In 1996, he was appointed by Lt. Gov. Kathleen Babineaux Blanco to be the state co-ordinator of Louisiana’s tricentennial FrancoFête ‘99. The successful event was recognized as the best effort of any state in the promotion of cultural tourism and set the template for the present-day cultural tourism industry. After retiring from the state, Gary was a volunteer at the Acadian Museum for many years. Thereafter, Gary worked for the City of Abbeville until he suffered a disabling accident on October 9, 2006. Gary has not let his injury stop his love of performing Cajun music and promoting the culture. Today, the “Russell Gary & Friends” band regularly plays at Eastridge Nursing home for the staff and residents.